Alright, I'm moving into a new place and the garage is pretty small. 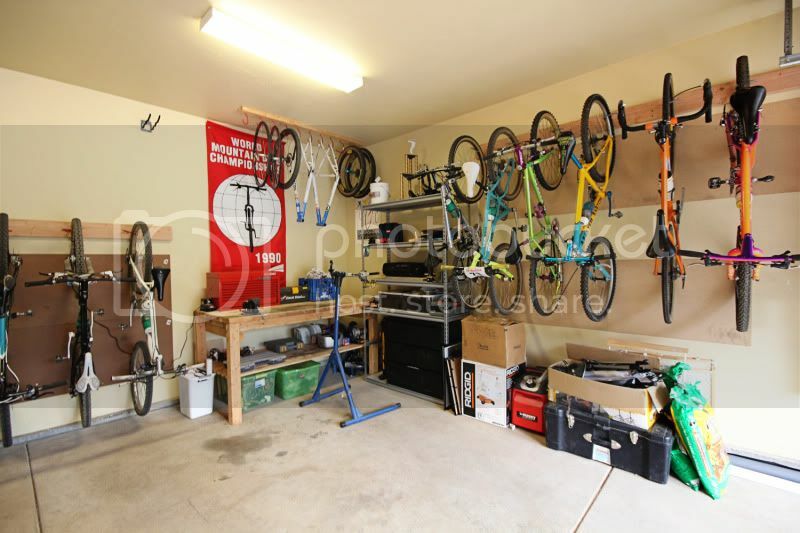 So I want to hang the bikes on the wall so they are vertical (if that makes sense). I'm thinking about buying some simple U-shaped hooks that screw to the wall, then using some S-shaped hooks on these to hook onto the front (or rear) wheels. I've used large, vinyl coated screw-in hooks for this with good success. Any hardware store will have'em. The screw end is typically about 2" of 3/8" lag screw, the hook is about 3" wide x 6" deep. Install them horizontally, and they can hook a wheel/tire directly. I've got a couple of the vinyl covered hooks if you're interested. Screw the U-hooks into a board and screw the board into the wall studs. As shown. I use hooks similar to these > http://www.ebay.co.uk/itm/Pack-of-6-lar ... 19e1dd9b10 . Bought them from the homebase on the myton road, think also got some from screwfix. Looks to be what Mike is using above. First time I used them drilled the brick and used a big rawplug. Second time directly into wood so no problems. You can offset the hooks (i.e. have one high and one low) to fit more in. Hooks every 10" (25cms) and i can fit 16 bikes on this wall. At that price can't go wrong. 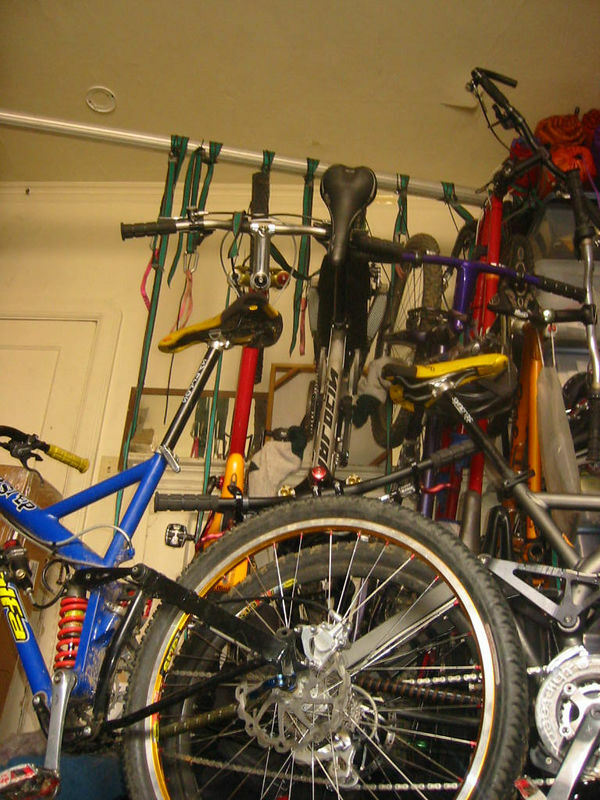 Mine are about 16" apart in a bit of 4x2 hung from the rafters and bikes hung alternately front wheel/rear wheel. Could get them a bit closer, but I was generous as I didn't what them scratching each other. Current Projects: The "3 way" Kona project. but I was generous as I didn't what them scratching each other. You can use old thick socks to cover the pedals, that helps a lot. In my old house I use to have a lot less space, plus it was a rental, so I use a aluminum tube from a hanglider wing and a bunch of straps, it works great too but the socks where mandatory..